In the name of Allah the most Merciful and the most Benevolent. Alhamdolillah, 5th Edition of The Spectrum is in your hands. We could not publish this edition at the end of 2016 according to the previous tradition; this delay is deeply regretted. The main reason was immense commitments of the editorial staff. Occurrence of this 8th PSCP Course provided us a big motivation to publish The Spectrum. Once again it would not have been possible without moral support of my editors Dr Sara Reza and Dr Maryam Rafique, who always persuaded me to continue the tradition without gap. We cherish the efforts of Prof (Brig) Abdus Sattar and Prof Asim Mumtaz (President PSCP), Dr Nusrat Alavi, Secretary PSCP and Dr Nadia Mehmood for arranging the 8th PSCP Course. We pray a big success of this great educational activity. 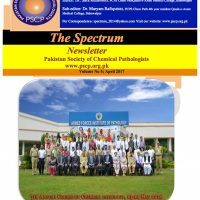 We dedicate this issue of “The Spectrum‟ to the “Chem Path Family” the name given to the WhatsApp Group of PSCP Members. The group is now the most rapid and effective mean of communication between the members. Its popularity has surpassed our Facebook group “Pakistan Society of Chemical Pathologists” which used to be a very active and popular IT-Based communication means at one time. In this issue we have very useful article on “Advanced Instrumentation in Clinical Chemistry” by Dr. Ayesha Hafeez, a very talented Consultant in Chemical path. “Laboratory Tests Repertoire to Facilitate the Organ Transplantation Program” by Dr Sahar Iqbal is another information dense article telling us about a new and very important area of patient care. Dr Younas has written about an important aspect of lab management i.e. “Communication Within the Laboratory and Other Departments of Healthcare Setup”. “Self Discovery in the Quest to Discover God” is written by a very promising junior trainee of AFIP Rawalpindi. A brief introduction of Functional Divisions of PSCP has also been given in this issue. Prof (Brig) Aamir Ijaz, Armed Forces Institute of Pathology, National University of Medical Sciences, Rawalpindi.